Find total relaxation at this modern vacation rental tucked along the Wailua River on Kauai’s east coast. The perfect couple’s retreat, the home offers a California king-size bed and a brand new bathroom with a bidet and tiled shower. Step inside the glass-door entrance, and be greeted by tropical garden views throughout the ground-level home. Keep cool with a quiet, split A/C system, or swing open glass windows to let in the fresh island air. Whip up an easy meal in a kitchenette with convection oven, microwave, and dining table, and grab complimentary drinks from the full-size fridge. Better yet, give the cook the night off and discover a slew of local eateries within a half mile of your door. Stop in Monico’s Taqueria for fish tacos or a seafood burrito, or head to Street Burger for American fare and cold beer. 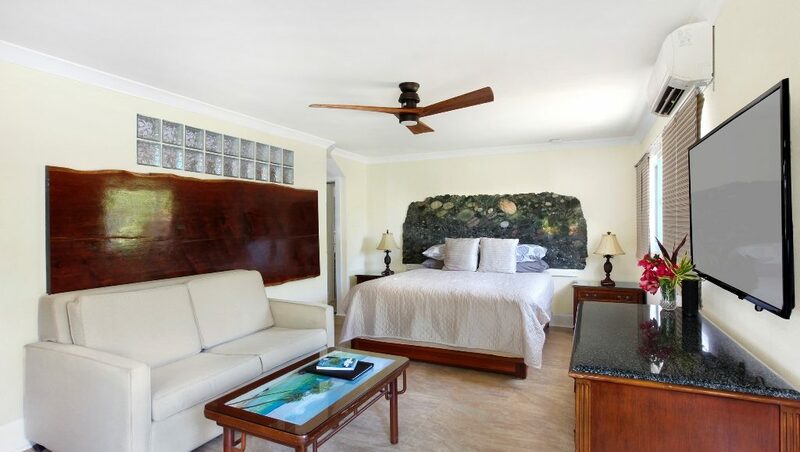 Ideally located just one block from the beach, your home away from home offers direct access to surf and sand. Looking for more fun in the sun? Pack a picnic lunch and pedal to Lydgate State Park on the two bikes provided. Or paddle along the Wailua River with the complimentary kayaks and stand-up paddle boards.